Hey there, class of 2017! It’s the right time of year to be thinking about your senior pictures! If you’re a swimmer, chances are you’ll want to show your love of the sport through your photos. But how do you make sure that your pictures look amazing when we all know that photos of swimmers in action aren’t always the most attractive? Read on for our tips on how to take the perfect swimming senior photos! Will you shoot your senior portraits at the pool or near a natural body of water? You probably spend a lot of time at your school or community swimming pool, so doing your pictures there can create a great sense of place for when you look back on your senior pictures with sentimentality. However, a lot of photographers prefer to shoot outside with natural lighting. A nearby lake or calm stream could be a great location if you want your pictures to have a sunny, outdoorsy look. Of course, you can always opt to do your photos in a studio. This will give you and your photographer more control over the final portrait. With the right background and props, you’ll still be able to get that flawless swimmer look. Do you want to be wearing your swimsuit, or is it enough to be wearing your team’s warm-up jacket? You can always wear both! If you have a letter jacket, consider wearing that for your pictures. You worked hard to earn that letter! Goggles are a must, just make sure they’re up on your head or in your hand so that your photographer can still see your eyes. If you look great in a swim cap, go ahead and throw that on for your photos, but don’t feel bad if you’d rather have your hair showing. Damp (not sopping wet!) hair can look really cool in pictures, especially if you’re taking studio photos but still want to look like you just got out of the pool. Okay, now that you’ve got your poolside glamour shots out of the way, go ahead and jump in the water if you want some action shots! Have your photographer take lots of these so you’ll have options to find your best look. Experiment taking pictures doing different strokes, jumping into the water, or using your reflection to get some super cool pictures. This might be a stretch, but if you find someone with experience in underwater photography, they may be willing to take some really cool underwater photos for you! Think about whether or not you’d like these kind of pictures and consider that when you’re looking for a photographer. 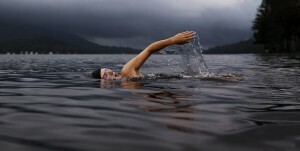 Make sure you find someone experienced in water and/or sports photography if action shots are a high priority for you. Most of all, I recommend looking at other swimmers’ senior portraits to get ideas for how you want yours to look. 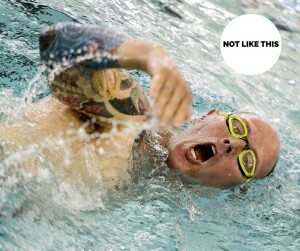 Then, think it over for a while, maybe during a swim with your waterproof iPod. Hopefully these tips inspired you to show your love for swimming in your senior portraits. Good luck with your photos, and congratulations on all of your accomplishments!